If you’ve set foot inside a Buy Buy Baby, you know that the amount of gear designed for tiny humans is staggering. I’m not here to tell you that you don’t need it. In fact, you need a lot of it. Especially this swing. 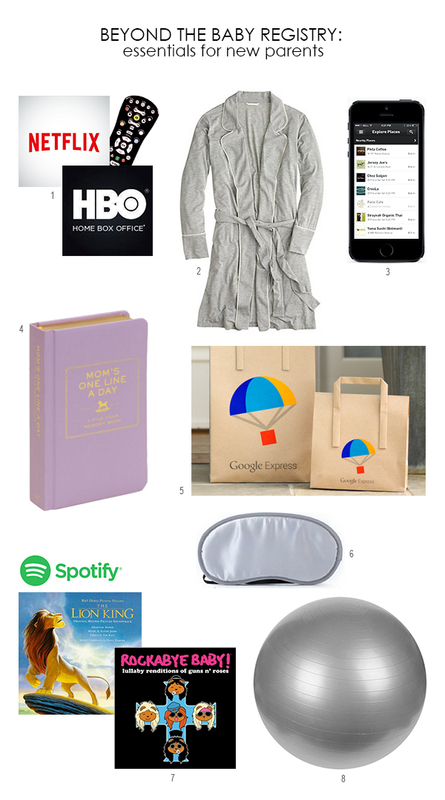 But during our first couple months of parenthood, my husband and I found that we used some things that weren’t on any baby registry checklist way more than our well-researched crib and its organic, orthopedic mattress (baby prefers to sleep in the fun, cuddly swing—can’t blame him). So beyond the standard baby-store buys, here are the unexpected and totally essential things that helped all of us—but especially me—make it through the first two months (and counting!). 1. HBO GO, Netflix, etc. For the first month, it felt like all I did was nurse. Like 24/7. And while I loved staring at my little one’s face while nursing (newborn eyelashes are the cutest! ), there came a time (okay, many times) when I started to nod off. Having a backlog of shows to binge-watch helped me stay awake during those marathon nursing sessions. 2. Bathrobe. Minus the three whole times that I left the house during the first month, I lived in a bathrobe. I was thankful to have something soft, comfy and nursing-friendly to mindlessly throw on. The pockets were also key. I could have burp cloths and other fun things on-hand at all hours, plus my phone for baby tracking, shopping (see number five), and of course, taking one million photos. 3. OrderAhead. We often forgot about making food until it was too late and we were already starving. We relied heavily on OrderAhead to get meals delivered from our favorite nearby spots. In case you’re wondering, spending an extra $6 to have Chipotle brought to you is totally worth it. 5. Google Express. I did almost all of our shopping at 3 a.m. on my phone during nursing sessions, ordering everything from oatmeal to wipes (so many wipes!) for same- or next-day delivery. We used Amazon Prime and Mom as well, but I found Express to be more user-friendly in my sleep-deprived state since it feels like I’m shopping the aisles of familiar stores (like Whole Foods and Target) and our new go-tos (hello, Babies R Us). 6. Spotify. We quickly realized that babies love music, then quickly ran out of baby tunes to sing. We both got Spotify so we could make shared playlists full of Raffi and Disney jams (tracks one, two and four from The Lion King soundtrack put us all in a good mood, no matter how early it is), plus lullaby versions of songs from non-children’s artists (think Eminem and Guns N’ Roses). Our baby’s favorite song is Sweet Child o’ Mine, possibly because it was one of the first songs he ever heard (turns out I was pregnant for this). 7. Eye mask. Everyone tells you to sleep when the baby sleeps. I found this easier said than done when the baby falls asleep on me in broad daylight. When I was awake, I kept this eye mask attached to my forehead so I could be ready to pull it down during impromptu naps. My baby probably thinks that’s just what my face looks like. 8. Exercise ball. I’ve used an exercise ball for at least two hours every day since coming home from the hospital and no, it’s not in an attempt to get my pre-baby body back. When our baby starts crying hysterically, bouncing on this ball with him is the quickest way to calm him down. Parents, are there any unexpected things that you found yourself relying on during those first months? I’d love to hear your tips and tricks, especially if they involve your child sleeping through the night. I have read your post. Thanks for this post, very good to know, especially for first time moms.